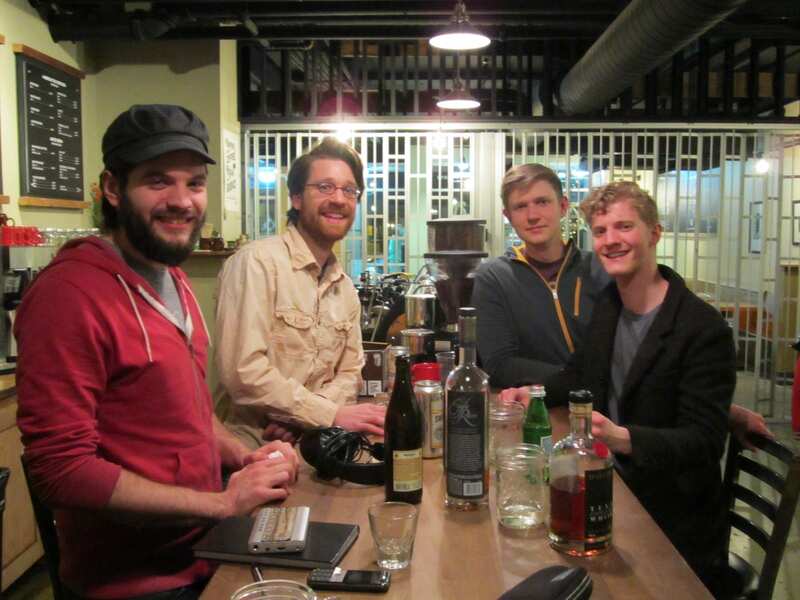 2014 has already turned out to be a very exciting year for Louisville’s coffee scene. 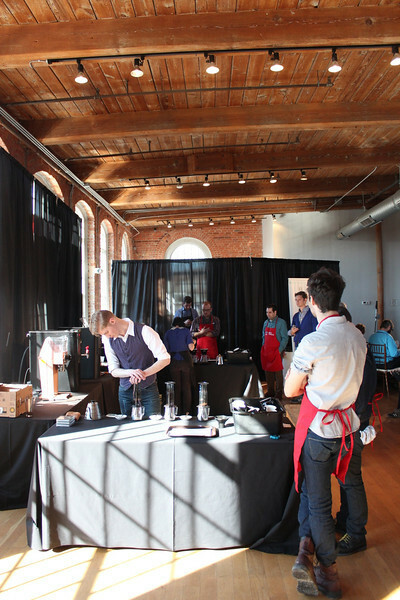 Four Louisville baristas competed this past January at the Big Eastern Barista Competition (one of the regional competitions preceding the US Coffee Championships). Houston Miller and Jesse Myers from Quills Coffee and James Tooill from Argo Sons Coffee took part in the Brewers Cup portion while Michael Butterworth competed in the Barista Competition. Jesse, Houston, and James all placed in the top seven, and James’s third place finished earned him an invitation to nationals. Michael placed fifth and will move on to the US Barista Championship. James and Michael will be the first baristas from Kentucky to compete at nationals. As a Louisville resident and coffee enthusiast, I wanted to hear first hand about their experiences, so the the five of us sat down together to have this discussion. So, why did you compete? I wanted to fix my legacy of disqualification [2 years ago]. I went overtime. I ground the 1st of my doses on the wrong grind setting, and then I had to go back and regrind. It took an extra 3 minutes, so I finished 5 seconds overtime. I competed mostly because I wanted to see the competition. I didn’t know a lot about it going into it. I never competed in an SCAA event. I just wanted to get my feet wet. The ultimate goal that I eventually want to do is Barista comp. And I didn’t have enough foresight to do it this year. There are two reasons. The first one is because I want to make a career in coffee. I don’t think, as a barista, you can make a career without competing. So, there is that personal development aspect—to grow as a barista, to really push myself, I needed to do a competition. And, secondly, I wanted to represent the Louisville coffee scene. I think the level of coffee being served here can improve, to be sure. But it really is exceptional for the city size, location, culinary culture. I mean, 3 of the top 7 baristas in Brewers Cup were from Louisville, and it was surprising for people that a first-timer [barista competitor] out of Louisville qualified. (I don’t take so much credit for that. There’s a lot of great people that helped me make that happen.) I want Louisville to be on the coffee map. A lot like Houston, I competed because I was curious. There’s so much that goes into these things as far as: the people competing, what sort of coffee they’re bringing to the table, what’s being exposed, what sort of skill levels are being represented and techniques. That’s just kind of fun. And then—like what Michael said, too—representing the city is a fun, cool thing. Representing Quills was great. I like competing a lot because you do learn from getting ready from it, but you also learn from being there. But those are super different experiences. When you’re getting ready for it, you’re just becoming more and more fine-tuned about exactly what you think the best thing to do is. And then you go to the competition and everybody’s totally doing different things. Is there a particularly memorable or fun experience from the competition? For me, what blew my mind was Erika Vonie from Ultimo’s barista competition routine. Her theme was umami, what umami is, how it’s created. So she had this sense perception and she based her whole routine around it. That was definitely the most educational experience for me. And it really showed me the power of a barista competition routine to educate, to illuminate, and to influence people. The most fun I had was actually tasting other people’s coffee. That was nice because a lot of times internet discussions about brewing seem very dry. But people who have that kind of information in real life are just perfectly normal people. Jordan Barber from Intelligentsia talked about brewing with a really light ratio, 1:18, with a really high extraction. I just went up to him afterwards and say “Can I try it?,” and he just made me a cup. That’s probably the highlight. It was really good. I was surprised that, once we got to the open service round of the Brewers Cup, a lot of the routines were amazingly different from each other. Coming into it, I kind of expected a lot of people to be doing really similar things. When we were out there and I saw the open service, there was a plethora of brewing equipment being used and a lot of people with different mindsets about how they want to brew their coffee. I thought it was interesting with the compulsory coffee. Because there was some bitterness with overroasting the coffee. So some people approached that by grinding coarser, some people approached that by using a cooler water temperature. Yeah, I just sorted everything. Houston and I stayed up until 2 AM, and we just took out anything that had roast defect on it, at all. We went bean by bean. If it had any sort of tipping or facing, it just got thrownaway. I just felt that made the biggest difference—just getting coffee that was uniform and free of defect. It’s so stupidly tedious [laughs] you would never do it in other circumstances. But I ended up sorting my open service coffee, and I learned something about that. I was getting this herbal, hoppy character. My citrics were more hoppy than I wanted them to be. So I figured out what roast color was giving me that, I sorted out that roast color, and I got rid of some of the citrus in my coffee. I never would have tried it [otherwise], ‘cause it takes 2 hours to make 3 cups of coffee. What seems to be the biggest challenge or frustrating part about the competition? The most challenging part of being a barista competitor is that you’re making coffee on an equipment you may not be familiar with. I was using the provided grinder, so I spent almost all of my practice time figuring out what grind setting I wanted to use. The frustrating thing for me was I didn’t get my espresso to taste exactly like I wanted it to. The judges liked my espresso, but they didn’t feel like it tasted exactly like I told them it would taste like. That really surprised me. Everyone who tasted my espresso in the practice sessions always commented, “Wow, this tastes exactly like you said it would.” So I’m trying to figure out how to change that for nationals. I think the most challenging thing for me was figuring out what I was supposed to put in my presentation. I got off stage and I was like, “Wow, that was so much easier than I thought it would be!” And then, after that I thought, “Wow, I should have said all of these other things!” When I talked to my judges, they said, “Yeah, you should have mentioned all of those things! You have so much extra time.” It was kind of frustrating in hindsight. I got into the roastery on Monday, after coming back. And the whole time I was roasting I was thinking about all of these things I could have said. I find preparing to be extremely challenging. There was a particular coffee—it was a Yemen—that I really wanted to use for the competition. And then I felt that it faltered. So I had to go back to the drawing board and pick another coffee. Even with that [competition] coffee—it’s a Kenyan, which is something I wasn’t used to roasting—I struggled a lot with getting a roasting profile for it. Probably the most challenging thing about preparing for the Brewers Cup is also roasting my coffee. It’s one of those times I wished I could use a coffee from another [roaster] that I could just be happy with. I would have just figured out how to work with it instead of spending so much time freaking out about [the roast profile]. I can say, as a barista competitor, I’m relieved I didn’t have to worry about that. And it’s nice having a roaster you can have complete and utter faith in. Jesse, did you find it easier to roast my coffee? I procrastinated for a long time about actually obtaining all of the equipment I needed for the Brewers Cup. I was going to use the Walküre. Well, it turns out the Walküres are from Germany and Prima didn’t have any [in stock]. So, I used the Kalita, which ended up being a much smarter choice. I have a feeling it would’ve been way too difficult to work with [the Walküres] in a competition setting. A frustration of mine, obviously, is I didn’t go on to the open service section. When I brewed my compulsory coffee, I loved the way it tasted and I was really shocked, perhaps, that the judges didn’t. I’m still waiting on my official scores to be emailed. But perhaps somewhere along the line my calibration for what I expected out of that coffee and what the judges expected were just not lining up. Michael and James, what changes are you introducing to your routines since you’re moving on to the nationals? Well, changing my coffee. I knew what my theme was before I chose my coffee, but the actual content was completely driven by the coffee. The way the different varieties in my espresso affected the taste was drove the routine—and also how the coffee was processed. I haven’t even tasted my competition coffee yet. So that’s kind of nerve-racking. I’m trusting our importer when he tells me, “This is the best coffee we can give to you. You should definitely use this coffee.” It’s an ACES lot from Cafe Imports from the Huila region of Colombia. One of the main feedback I got from the technical judges was that I wasn’t very considerate of their job as a judge. I was still talking to them about the overall flavor while they were taking in the aroma. They said that was pretty hard, because the aroma and the flavor were pretty different from each other. I never really considered their actual physical need for tasting and smelling. So I’m going to change that a lot. I’m also hoping to be more confident about my roast, and also looking to the possibility of sorting the greens by size. Finally, what advice would you give future competitors? Michael: First of all, just read the rules over and over again. A lot of competitors base their routines off the routines they’ve watched and the routines they’ve enjoyed. But a lot of the things that you see in a routine have nothing to do with how the routine’s actually scored. Secondly—and more important, actually—is find a good coach. Because if David Buehrer and John Letoto [from Blacksmith Coffee, Houston] hadn’t taken me under their wings, I wouldn’t have qualified for the nationals. Most baristas tell you your first year’s a throwaway year. I don’t want to put in all the time and effort to just throw it away. I wanted to take it seriously my first year. I agree that the most important thing is to thoroughly read the rules. For Brewers Cup, the rules tell you a lot of things about what you’re going to do and how you’re going to be scored. But, ultimately, talk to as many people as you can who have done it before. Because the most important thing to relieve pressure from yourself is to simply understand what’s expected of you. Know what the layout is going to look like, where you’re going to go, and what you’re going to simply do with your stuff. I would say my advice is, “Just do it.” You just need to throw yourself into it. Plus, it’s really great for professional development. It shows that you really care. A recent Louisville transplant, Mikey discovered craft coffee as a grad student in Ann Arbor, Michigan. He has since then turned into an enthusiast and avid homebrewer. Having grown up in Indonesia, he dreams of seeing more coffee from that region featured in specialty shops and competitions.